LOOK! HERE I AM COMBINING CAPS LOCK WITH TOO MANY EXCLAMATION POINTS AND A BOLD FONT!!!! TO THINK I WOKE UP THIS MORNING FEELING 17% LESS LUDICROUS THAN NORMAL!!! IT WASN'T PMS AT ALL!!!! IT WAS LACK OF CAPS LOCK!!!!!!!! The amazing part of this? 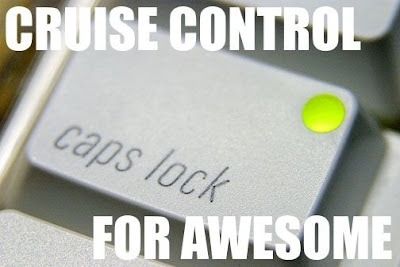 To me, it's that "caps lock" is in all lowercase letters! WATCH OUT WORLD! I JUST GOT ME SOME AWESOMENESS! EXCELLENT POINT!!!! AND I'M NOT JUST TYPING IN CAPS, I'M SHOUTING THAT YOU ARE GOING PLACES MY FRIEND!!! AND SERIOUSLY, WHEN ARE YOU GONNA BREAK DOWN AND GET A TWITTER ACCOUNT? YOU'RE MISSING ALL THE FUN! EVERY EMAIL FROM MY MOTHER IS ALL IN CAPS.!!! THE SCREAMING & YELLING!!!! REMINDS ME OF MY CHILDHOOD!!!!!! MY FRIEND KELLY EMAILS AND TEXT'S ME IN ALL CAPS--ALL THE TIME. EVERYTIME I HEAR FROM HER, I GET ALL ANXIOUS AND TWITCHY. I GUESS IT'S BECAUSE HER ALL CAPS MAKE ME FEEL LIKE WHATEVER SHE'S SAYING IS MEGA-URGENT AND MY BODY GOES INTO REACT-MODE.